Not all development environments fall under the traditional model of a manufacturer with an supply chain. Join ventures, mergers, divestitures and co-development projects all have unusual product development environments. This eBook focuses on the best PLM systems for those circumstances. This eBook is of most value to executives leading product development efforts as part of co-development, long-term programs, joint ventures, mergers, acquisitions or divestitures. Product development does not always happen under conventional circumstances; nevertheless, it must be executed on schedule and according to plan. Sometimes, a great opportunity emerges and a co-development project needs to ramp up instantly. Other times, a program must adhere to a rigid schedule, as typically happens in the aerospace and defense industry. And in yet other cases, ongoing development must be partitioned off while the company undergoes a merger or acquisition. These unconventional situations are a great opportunity for a business. However, they burden product development efforts with new and unusual requirements and constraints. 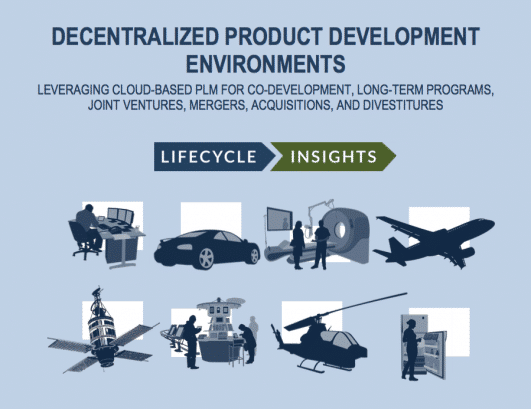 One noteworthy constraint is how, when, and why to deploy the Product Lifecycle Management (PLM) system—the enterprise system that supports product development—in these environments. In co-development scenarios, partners are usually not willing to expose all of their digital intellectual property, so creation of a new, independent PLM environment is necessary. During a spin-off, merger, or acquisition, the development organization’s efforts must remain isolated while the pending transaction executes. All of these scenarios must be supported, despite their difficulty. Ultimately, these out-of-the-norm projects may need the support of a PLM system even more than traditional, in-house development projects do. Integrating the product development efforts of multiple organizations or coordinating development during business transition is turbulent and wreaks havoc on certain products or product lines. Chaos is detrimental to the business and reduces shareholder value. In these situations, a traditional, on-premise PLM solution is not the right answer. Its setup takes too long, requires too much effort, and demands too much up-front cost. Time, effort and cost are often critical pressures in these situations, so most organizations find themselves in a catch-22. They need a PLM system, but traditional solutions are non-starters.